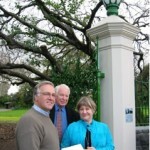 In association with the Prahran Mayoress, Susie Chandler, raised funds for the reinstatement of the Fountain. Replacement of the vandalised and badly corroded urns and statuary with cast bronze. Initiation of the new Murray Street fence and reinstatement of the ornate gates and lights. Provision of much of the current seating, including the circular seat around the Weeping Elm. The refurbishment of the badly corroded High St Gates and repairs to the High Street fence. The provision and planting (and important formative pruning by member Peter Murk) of the ‘step-over’ apple trees in the parterre garden – another outcome of the Master Plan. Propagation of the rare South African Willow by the Royal Botanic Gardens and replanting. Production of the collection of Postcards, and Many smaller projects over the years. 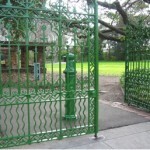 The Friends of Victoria Gardens initiated and provided support to the City of Stonnington to restore the significant High Street Gates. 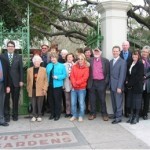 The cost of the project was $30,000 of which $5000 was provided by the Friends of Victoria Gardens. The gates were severely corroded, some of the decorative scrolls and spears were missing, and the lock had rusted away. Only one handle remained. The restoration was undertaken by Neil Tait, and the missing parts recast by Billmans Foundry, both of Castlemaine. The project was assisted by Don Goldsworthy, Urban Design Consultant. 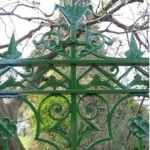 About 12 layers of paint were removed and analysis of the original colour revealed a light green colour – Australian standard Colour – ” Moss Green ” code G14. The gates have been repaired to near original condition. The Gates are expertly crafted and according to Neil Tait; the magnificent castings and decorative iron work, fitted together using only pins, would today cost well in excess $100,000 to replicate. 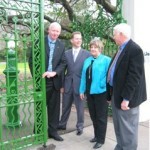 The Gates were formerly reopened on the 18 July 2006 by the Mayor Cr Anne O’Shea.